Kiddush Hashem, the sanctification of G-d's name, is not a simple decision. When the opportunity presents itself, an individual is involved in a tremendous internal battle. The natural action would be not to perform such an action.. 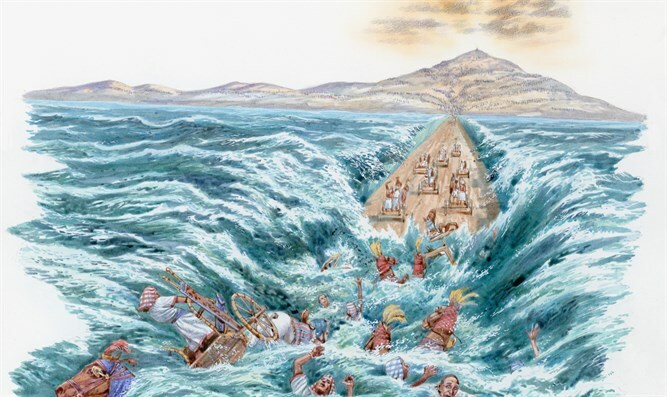 In this week’s Torah portion, the Torah records the famous story of the Jews fleeing from the Egyptians and reaching the Red Sea. The Talmud focuses on the moments while they were waiting by the shores. There is a discussion as to how Judah sanctified the name of God publicly, known as kiddush Hashem, and two well-known stories are told of what would appear to be acts of courage (Sotah 36b-37a). Rabbi Meir explains that when the Jewish nation came to the Red Sea, a scuffle broke out between the tribes of Judah and Benjamin. Each wanted to be the first to jump into the water. The people of Benjamin won the battle, leading to them to being stoned by those from Judah. The Talmud explains that each was subsequently rewarded. The tribe of Benjamin received the portion of land where the Kodesh Kodoshim, the Holy of Holies part of the Temple, would be situated. This is the place where the presence of God would be “located”. The tribe of Judah received the line of kingship. Tosfot, in his commentary on this section in the Talmud, cites a Mechilta, offering an analogy with a king and his two sons. He instructs the older one to wake him three hours into the day, while the other is requested to wake him at sunrise. When the younger son attempts to waken his father, his older brother stops him and explains he is supposed to wake him later. The younger son disagrees. In the ensuing argument, the king wakes up and explains he is happy with both his sons. Their intentions were correct, that being the critical part. Like the Talmud, the Mechilta relates this back to the story of Judah and Benjamin at the Red Sea. Judah’s stoning of Benjamin was a reference to his jealousy of Benjamin fulfilling the task instead of him. The Talmud referenced above presents a second, alternate version of the story. In this account, none of the tribes were willing to jump into the sea. Nachshon, future head of the tribe of Judah, takes the lead and jumps in. His action thus served to be the public sanctification of God. Often, these stories, especially the second, are used to demonstrate a tremendous level of courage and faith. Yet these stories raise many questions. For one, there is a huge discrepancy between the two versions. In the first, the Jewish people seem to be on a very high level, fighting it out for jumping in first. In the second, they have the very opposite reaction, refusing to consider the dive of faith. One can also ask the importance of knowing about the supposed stoning. Finally, there are the two rewards. The actions of Binyamin and Judah seem to be identical, and Tosfot certainly equates the two based on the reaction of the king. However, the rewards are completely different. One reward has to do with the placement of a part of the Temple, while the other refers to the future kings of Israel. The conventional interpretation focuses solely on the pure faith exhibited by these people. However, it could also be there is an important insight into the idea of sanctifying God and the traits of leadership. Let’s take the story of Nacshon first. The line of Judah is known for the idea of leadership, traced back to the story of Judah and Tamar. When Tamar was being brought forward to be killed, Judah faced a pivotal moment. It was clear the public sentiment was to kill her, and most leaders, driven by popularity, would succumb and move forward with the capital punishment. Judah, though, acted in line with what was true and correct. He made the unpopular decision, going as far as acknowledging he was wrong. The paradigm of leadership is to decide the correct path no matter what the public perception is. Not only does this impact the leader, but it can create a tidal shift in perspective on the part of those witnessing the action. Nachshon displayed this same trait. The Jews felt they were trapped. They saw no hope, they began to question the entire plan of God and Moshe, and their faith in God began to wane. Nacshon sensed this and acted in a manner that was completely contradictory to their frame of thinking. This was a true act of sanctifying God, this being a critical trait of any future king. The first story highlights an important insight into the idea of kiddush Hashem. The opportunity to engage publicly in kiddush Hashem is uncommon. When the opportunity presents itself, an individual is involved in a tremendous internal battle. The natural action would be not to perform such an action. Factors such as social peer pressure and survival instinct have a serious impact on the ability to act against the grain. To overcome such internal obstacles reveals the character of the individual in a profound manner. The battle between the two tribes reflects the high level they were on, not remotely perturbed by the normative anchors holding back the average person. When the people of Benjamin were “victorious”, the people of Judah understood they missed out on a special moment, one they may never have another chance to be a part of. The intense regret felt, the desire to be in that moment when one’s entire existence is in line with the true path of action, explains the idea of “stoning”. The rewards reflect this idea of kiddush Hashem in two different ways. For the tribe of Benjamin, the location of the Divine presence is the natural result of their actions. The presence of God is the ultimate revelation of kiddush Hashem. It means the Jewish people are adhering to the Torah properly, the Temple running accordingly, demonstrating to the world the reality of God. For the tribe of Judah, being king meant many future opportunities to engage in kiddush Hashem. The kings of Israel would face many moments like at the Red Sea, and the chance to take advantage of them would be present. The lessons here are obvious. Leaders today are driven by polls and the allure of popularity. The Jewish leader must be driven by what is correct. As well, the opportunity to act in a manner of sanctification of God is momentous and powerful. For many, the external and internal pressures serve as obstacles to this performance. To overcome them is to raise oneself to the highest possible plane of existence.